Anything to make travel with children easy! My daughter and son-in-law have just taken their two young daughters to Australia for a family wedding. Seventeen hours on airplanes was a challenging prospect for all of them. I got them ‘travel essentials’ for Christmas and they have been a success. Here are the best. These Skip Hop rolling suitcases are perfect for little travelers. They suggest ages 3+, but our 2-year old granddaughter handled hers with a smile. These have an adjustable strap so a parent can sling them over her (his) shoulder if the junior traveler gets tired. 7 x 12.5 x 18 inches. From $30 to $38 depending on your choice of creature. My grandchildren are energetic and they spend little time in front of any kind of screen – exceptions are mostly stolen moments on a parent’s iPhone. Long plane trips are good times to make exceptions. 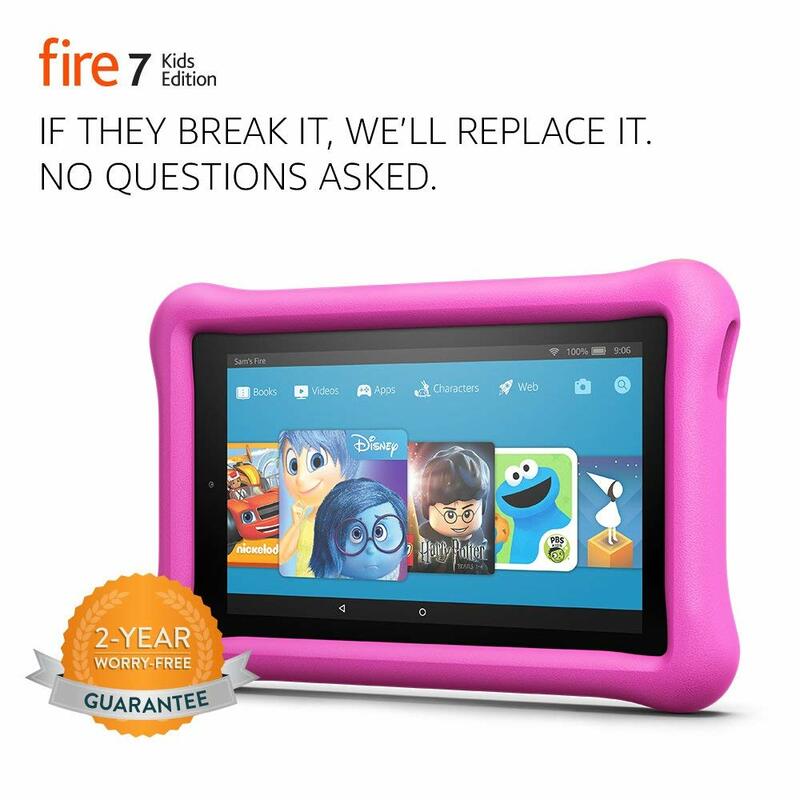 The Kids Edition Kindle Fire is a perfect size for kids, and parents can load it up with enough TV, games and kids’ movies to get the family anywhere they want to go. Most of the content my family chose was free with Amazon Prime. It comes with a full two-year replacement guarantee. 7″ screen $99. These pink headphones with cat ears have volume limiting technology and they are durable. They get a lot of smiles. $14.99. These lightweight Philips Kids headphones have a volume limiter for safe use. $14.99. There are Blue Tooth versions of these headphones. I prefer not to have batteries near anyone’s head, but they do eliminate the cord. Lonely Planet offers travel activity books for kids of all ages. Time for a drink (for the kids, I mean). These will keep liquid where it should be, even in a bumpy plane. They are dishwasher safe and free of BPA, Phthalate and PVC. $6.99. $19 – $20 depending on the creature. These soft-plush Kid’s neck pillows come in 26 combinations of color and critter. From $7 to $12. Fly-ToT was designed by two young British moms who wanted their children to be comfortable on long flights to Hong Kong. This Fly-ToT inflatable pillow fills in the space in front of a standard coach airplane seat where adults would put their feet. It gives your child a flat space for sleeping. You can still use the seat belt, loosely. It must be deflated during take-off and landing. It takes 2-3 minutes to inflate and deflates in a few seconds. The Fly-ToT weighs 2.3 pounds. With the pump, you will carry 3 pounds. Inflated the Fly-ToT is about 23” x 15” x 18”. $79. Try to put even very small children in charge when you can. They can plan the next hour or choose between two activities. Everyone likes to be in control occasionally. Overnight flights are usually easier for kids. They sleep on the plane and get lots of daylight the day they arrive at the destination. Seat Guru is a good place to find kid friendly seats. Can we enjoy traveling again?